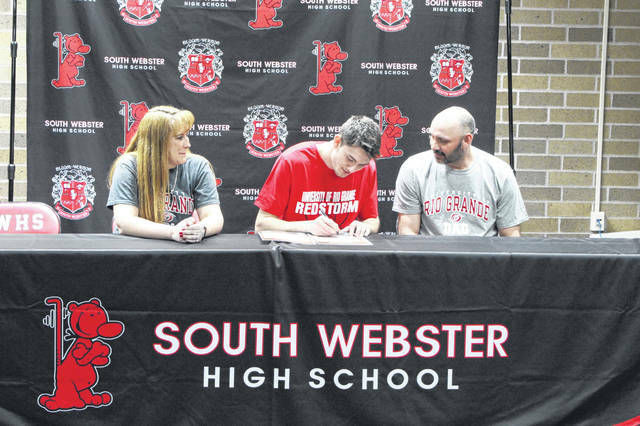 South Webster senior Shiloah Blevins signed his letter of intent to enroll and play collegiate basketball at the Univeristy of Rio Grange Friday afternoon. SOUTH WEBSTER – “The Jeep Freak,” as he’s so promptly been called by those who compare his athleticism and playing style to Milwaukee Bucks superstar Giannis Antetokounmpo, Shiloah Blevins signed his letter of intent to enroll and play collegiate basketball at the University of Rio Grande at a signing ceremony Friday afternoon at South Webster High School. During his time in a Jeep uniform, South Webster was three time sectional champs with making district finals appearances in 2017 and 2018 and a district semifinals appearance in his senior season. In his senior season, Blevins averaged 19.0 ppg, 12.0 rpg, 4.0 apg, and 3.0 bpg and was named the District 14 coaches’ district player of the year. Upon enrolling at Rio Grande, Blevins plans on majoring in nursing. Without his friends and family supporting him every step of the way, Blevins says he’s not sure if he’d be in the position, he’s in today.